It's finally February, and I love Valentine's Day. In honor of it, I offer this quote from Charles Darwin when he courted his wife Emma. I first read of it in Christopher Benfey's New York Times Book Review article on Darwin's Sacred Cause: How a Hatred of Slavery Shaped Darwin’s Views on Human Evolution by Adrian Desmond and James Moore. Then I found the Darwin Correspondence Project online, and looked it up. 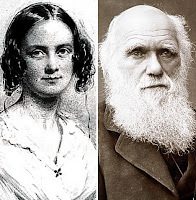 Charles Darwin wrote to an old school friend on May 8, 1838: "As for a wife, that most interesting specimen in the whole series of vertebrate animals, Providence only knows whether I shall ever capture one or be able to feed her if caught." Who says science types aren't romantic? The title of this blog post and the photo above are from London's Daily Mail.